For the first edition of this new BINTH design we collaborated with some of our favorite fellow graphic artists and friends: Kristen Caston, a fantastic hand letterer and graphic designer. Donovan Beeson, known to the world as the co-founder of the Letter Writer Alliance. Kayu Tai a wicked smart Digital Art Director and Illustrator. Designer/Photographer and master of all things beautiful and vector Diego Mota. And lastly the amazing team from Design Firm Language Dept., NYC. Each designed their favorite Alphabet Letters. 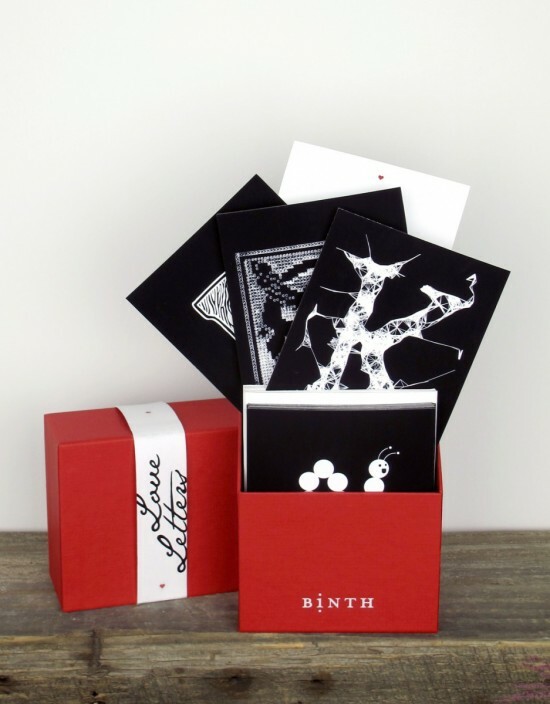 Screen-printed by hand on a beautiful rich duplex paper stock, BINTH Love Letters will come in a sturdy keepsake box. (We included envelopes, so you can send our Love Letters to the ones you love but they look amazing framed as well.) If this isn’t enough love for you, we will also offer our collection as large 26″ x 40″ posters. We believe that typography is a form of architecture and decided to give proceeds of the sale of our this Collection to PublicArchitecture.org Let’s build words, sentences, schools and libraries together! You will have to wait to see all of our letters until the end of the week. (Actually, I will post some more tomorrow…because I can’t wait “til the weekend to share them all…) Please come out and join us for the release party of BINTH Love Letters, this Sunday, 1.29.12 form 3-6pm at the BINTH Store + Studio.